The week has been one filled with a tonne of traveling, which explains why I had kept blogging on the back burner for this short while. 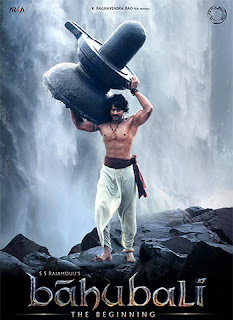 Apparently, what eats away our productivity more, working at my office workstation or browsing endlessly on facebook at night the anxiety to come up with something market-shattering with every blog post is a question tougher than answering why Kattappa Killed Bahubali. Question: "I'm planning to join a gym to get in shape from a considerably long time now. However, one thought haunts me. I am being told that once I stop going to the gym, I will not only be loosing all my hard earned results, the state in which I will be left is going to be even worse than what I started with. I also read in a magazine how the rate at which I put on fat on my body is going to be higher than what I did before I started exercising. Is this tradeoff worth taking the exercise route? I'm confused." Once we engage in a physically demanding endeavor such as continued, progressive resistance training, our caloric needs increase. As a result, after a period of 6 to 8 weeks of following a workout program religiously, we may find out that our appetite, especially during the peri-workout window circling around 3-hours post our training session gets boosted up. Most individuals report unseen levels of hunger after an intense bout of weight training or any other form of anaerobic training. Our eating patterns transform and necessities enable us to eat more calorifically dense foods(Nuts, Cereals, dairy) in order to bridge the gaps between the needs of our next training session and the supply of nutrients we influx into our bodies through food. As our workouts keep getting more challenging(Since every resistance training exercise involves a progressive overload over a period of time) our training needs keep getting more advanced reaching a point where absence of quality nutrition may end up in experiencing black-outs and nausea/vertigo while training. Compare that to a situation where training suddenly gets to a halt and your body transforms into a sedentary phase of living. Although our physical activities and as a result, the demands have jolted their brakes, our desires to eat more and the emotional attachment to the good old carefree eating days still remain our favorite toys we are not ready to lose. As a result, we are now living in a state which is the complete nadir of what was going on when you were a serious trainee within the gym. And since during those initial 8 to 10 weeks of your gym membership or following of that particular exercise program, your motivation levels were sky high and knew no bounds, you actually lapped quite close to one of your very best performances under the bar. This just made things worse and increased the contrast between your metabolic rates then and now. As a result, the excessive calories consumed now on are for sure going to find a way to get their existence justified within your bodies, and mostly will choose the path of least resistance. Simply said, you will now give the calories you consume, a reason to be settled and stored as the metabolically less active state: Stored Fat. Body fat percentages rise and the once cherished look in the mirror slowly starts drawing the dissatisfied looks from you. Why do we get even fatter than what we started with? Devastated with the aforementioned episode of self body image destruction, most ex-trainees might descend into a state of very mild trauma. And delicious food choices, as we know them, most often are more entertainment than nutrition, especially in less active situations like this one here. If something takes you out of a state of depression, we should take more of it, right? Well, so does out hypothetical early retiree from training. It's then that this friend of ours starts experiencing a host of unwanted symptoms in his body composition, including a sudden, unexpected surge in hunger pangs, surprisingly poor food choices, inability to control cravings and an overall retarded sense of well being. 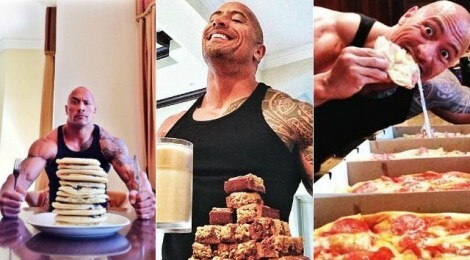 Dwayne "The Rock" Johnson might be able to gulp junk in his meantime, but YOU after a sabbatical from exercise may not. Sorry! What went wrong here? Was it the training which can be put at fault here? As most readers reading this anecdote may be realizing by now, it was not the time when the subject was putting all the efforts to get quality training stimulus while exercising in the gym. Things in fact went wrong when all the quality effort was aborted while the adjoining eating patterns were not simultaneously and accordingly tailored. Question: "I'm a housewife and have a history of having trained with weights seriously for a couple of years. My goal is to train for strength and hypertrophy improvement. Recently, most of my time is spent taking care of my kids at home, which does not allow me to travel to train at a good gym. Is there a way I can train at home and replicate the kinds of results I got while I used to train at a fully equipped gym? I understand it becomes unreasonable to ask for matching results at home, but, there's got to be a way, right?" Answer: Absolutely yes. 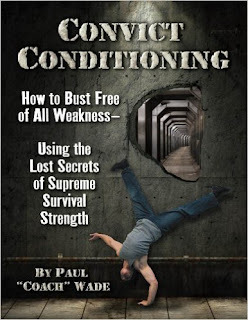 There are way lot ways to improve one's physical strength and conditioning than what most of us would believe. For instance, here's a program called Gravity Iron by Tom Furman, one which I have followed for a good amount of time while having very limited access to a gym. One of the best things I can recollect from my workout notes was the almost perennial possibility of progression there. The program prescribed performance of deadlifts twice every week. I substituted it with kettlebell swings with a 32 Kg bell, in absence of a barbell at home and it worked awesome. Every bodyweight lift consisted of a target number of repetitions which can be completed in any number of sets depending upon how advanced an exercise we have selected. There is a bodyweight pushing movement such as the pushups, a bodyweight pulling movement such as the pull ups or bodyweight rows(I did these on the TRX). I enjoyed doing it for months, while progressing in my bodyweight movement performance, all in the confines of my room. 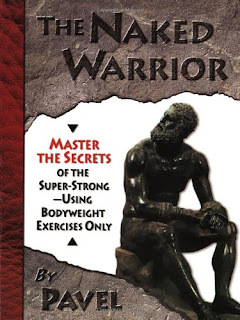 Another working option comes from the work of Pavel Tsatsouline who has written extensively on utilizing bodyweight training for strength development in his book, The Naked Warrior. The premise here lies in performing submaximal sets of a pair of bodyweight exercises which have minimal topographic overlap in terms of the muscle groups utilized, eg: The one arm push up and the One legged squat or Pistols. The regimen here tells your to keep performing sub maximal practice sets of selected exercises(usually not more than two) throughout the day, in order to grease the groove or train the neural pathways to perform that movement more efficiently. In other words, you keep getting stronger at those lifts. You may need to make sure that you are never tired, always refreshed at the start of a set and never ever reach failure on any of the sets. What's more, you can do your workout almost anywhere you are, the office, the home, even in a hotel room; the likelihood of getting your training session done gets higher. Equipment needs are negligible; in fact the only set of equipment I may suggest here is a pull up bar since that is a piece tough to arrange in a typical house design here in India. At the end of a training block of 8 to 12 weeks, you may be amazed at the ability you would have gained from all those repeated sub maximal efforts spread throughout the day. Even more magnificent would be the carryover of strength to other lifts especially in terms of tension generation capability of the body under heavy loads. An aside to the Grease The Groove concept is this magically effective and simple program by Pavel called The Fighter Pull Up. Read it here; it might be one of the best pieces of advice you may ever have read on bodyweight exercise training. Once you have gained significant prowess in the Naked Warrior exercises, the One Armed Push Up and the one legged squat variations such as the Skater Squats or Pistols(Believe me, it will be a hell lot of time before you reach a comfortable expertise level in these movements, especially if your bodyweight is towards the higher side), you can periodically test your strength using challenges such as Doing 50 consecutive Pistol Squats and similar bodyweight training feats as featured here in this blog post by Eric Moss SFG, SFB. This plan entails an uber-simplified and very gradually progressing approach towards achieving these milestones of strength/strength-endurance ensuring solid technique is being forged in the process. 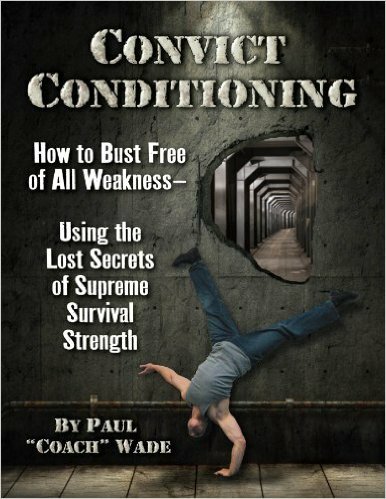 Paul Wade's Convict Conditioning is robust long term bodyweight mastery plan one can utilize in almost any kind of home set-up. These and several other ideas suggest how sky is the limit when going ahead and designing a strength training program using minimal equipment at home and decent levels of physical improvements can be gained, given consistency is being adhered to. Question: "I travel a lot and was recently suggested by a friend who is a follower of Yoga tutelage led by Swami Ramdev based in Haridwar, India, as an exercise medium. How effective is Yoga going to be for helping me lose some kilos? Is it really all that people claim it is?" Answer:If I am a proverbial couch potato whose favorite pastime includes surfing through the plethora of TV channels while sipping Soda along with donuts for major parts of the day, while I am not busy sitting for chronically prolonged hours in office: Then YES. getting involved in a regular Yoga session is definitely going to be a weight loss tool for me. This is because it brings me out of my immobile and sedentary state and makes me move my joints through their complete range of movements. Several intermediate to advanced Yogic poses may require us to hold a solid isometric contraction for a prolonged time. Asasnas such as the Mayurasana, or the elbow lever is a great bodyweight strength and balance feat to practice. Adho Mukha Vrksasana or the handstand pose can be a daunting practice for even strong folks who have less exposure to bodyweight training. The padmasana is an excellent hip mobility drill which can be a useful tool for loosening up the hip joints preparatory to several activities. The sheershasana or the headstand is one of the best ways to strenghten the entire spinal column for taking up compressive stresses and strengthening the adjoining musculature. Naukasana or the boat pose helps develop isometric strength in the abdominal muscle groups and chakrasana is a drill which can help alleviate back pain in chronic sitter and reverse the ill effects of prolonged sitting. Bhujangasana is an asana which I use a lot for lengthening tightened frontal abdominal musculature and hip flexors after a long day at office. And we aren't even discussing yet the benefits of Pranayama or the yogic science of breath control and meditation. What separates pranayam from the traditional yogic poses is the ways in which it enforces breathing techniques and lets the body connect with itself(one of the key ways in which yoga acts as an effective physical and mental recovery drill). Pranayam drills such as kapaalbhaati pranayam, anulom vilom, Bhrasrika Pranayam etc can be done anywhere and heal several ailments including digestive issues, endocrinological disorders and restoring of balances, improving alertness, relieving stress and igniting metabolism. While there is a boat load of benefits that can be accredited to a regular yogic practice, there are of course a lot of maligned thoughts which may not be direct benefits of yoga per se. This brief post may not be enough really to summarize the immense changes which we can all enjoy after a regular practice of Yogasanas in our living room every morning. That said, there is still some category of benefits which may not be as readily obtained from a singular practice of Yoga as can be gained from a combined approach consisting of resistance training and appropriate cardiovascular training; not to mention the amount of dietary cleaning that might be required alongside. In other words, we may not be able to expect our body fat percentage to drop significantly by a mere application of Yogic principle. When I say significantly, I am considering a decent level of drop in body fat in beginning training population owing to their inactivity from so many years. However, as you progress with your practice, the need for a higher amount of training stimulus than bodyweight alone will be felt. At this point, you can incorporate a calculated and modulated approach of weight training. That's a quick nitty gritty for the week. Do comment and share your thoughts on whatever you liked or disliked about the post.